Slow start-stop morning. Rush to finally get sorted and out of the house – doesn’t happen until after lunch – kicking myself, never mind. Then onto learning about the trains on the fly – whoops, missed one, oh well. Caught the next train. Then suddenly it says the destination is now where we came from – what? We jump off – only to see it progress to where we thought it was going, bugger. Apparently the ‘city loop’ messes with what I would consider the conventional naming of things. Mel has a mini-meltdown, Michael and Emma vacate the platform. We regroup and jump on another train only to find out from a passenger that this one IS actually going back to where we came from – seriously?! Jump off again to the one across the platform and lo and behold – it goes to our station! We ask where Bourke Street is – apparently we are already on it – ha, awesome! Such tourists…. After the shenanigans of the train, finding our destination turns out to be super simple – it was just down the street (yay!). 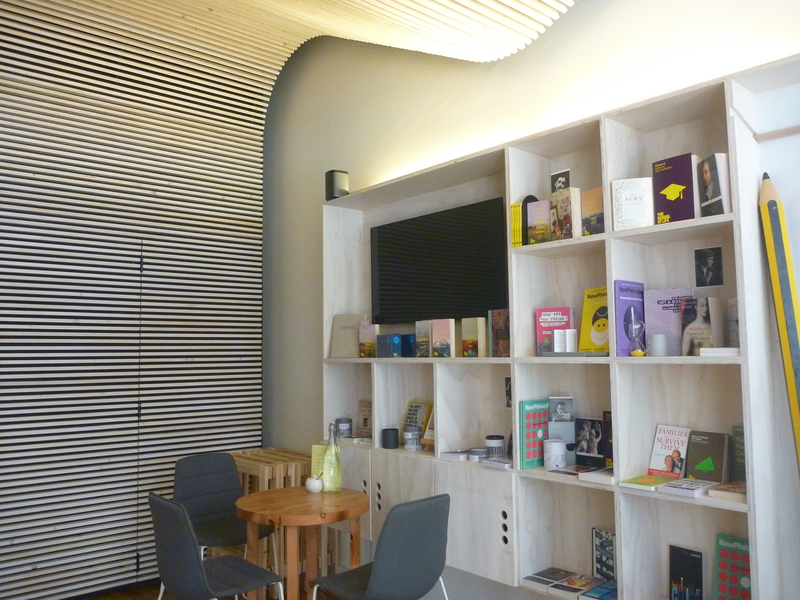 The School of Life, Melbourne, sits on Bourke St – mere metres from Southern Cross Station. When we arrive we are greeted by the wistfully pleasant Genevieve, who also turns out to be the queen of books (later walking us through some of the must reads on the shelves – i’ll be adding them to our reading list). We are here to talk with Jess, the Community Manager, who meets us with a great openness and honesty. 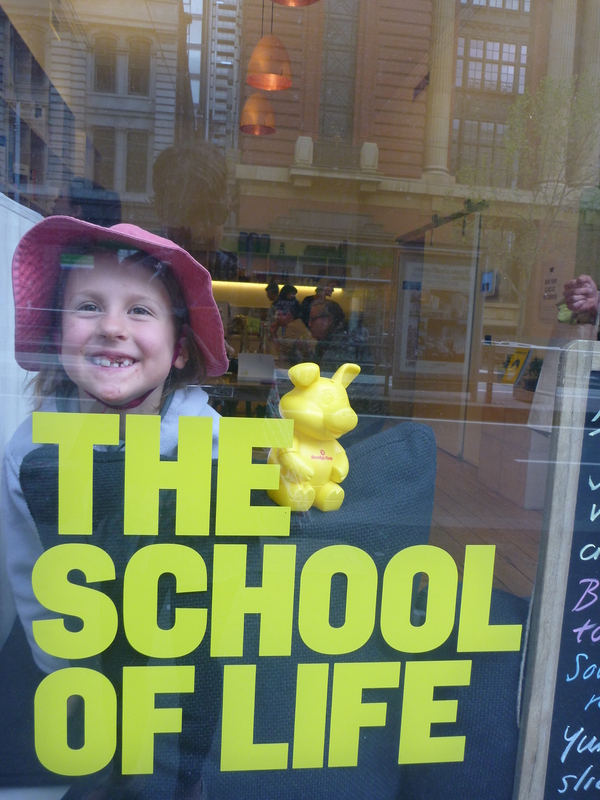 She has kindly agreed to chat with us about the workings and passions of The School of Life Melbourne (which I shall hereafter designate TSOL for the sake of my typing fingers and sanity). It turns out that describing TSOL to people is hard for us when mentioning this as one of our Melbourne-town destinations. I think that’s because it’s a new kind of beast – part education centre, bookshop, cafe, art house, community/connection/conversation builder and purveyor of fine inspirational goods & tools (like their awesome conversation cards, the 15 minute important life activity hourglass timer or the hilarious tote bag labelled “emotional baggage”). The original TSOL was founded in London by modern-day philosopher Alain De Botton. A group of super interested social-doers, through a local Melbournian social enterprise (who are also responsible for the Dumbo Feather publication you may have seen kicking around) approached the SOL about trying something here. The result was a pop-up that piloted last year – for which they had a wait list of 800 people wanting to take a class with 26 spots – clearly there was something in this! So the dedicated group forged ahead and this permanent – and first – international outreach was born in Melbourne. There are now 6 others in places like Amsterdam, Rio and Paris. I asked Jess what she thought it was about TSOL that made it unique – she said it seems to fill a gap for people, that something is missing and it helped give them insight into themselves plus a connection to others. That pretty well seems to reflect TSOL’s core business – developing emotional intelligence. I feel like lots of people spend decades pondering these topics in solitude before ever getting a breakthrough or finding the insight they seek. What a grand idea to have an inviting, funky, well run place for the general public to come and engage in such important inner work. The demand for their classes hasn’t waned, regularly selling out. I want to ask what it is about this educational model that makes it work, but before I can, Jess gives me the answer in describing how TSOL is unique – seems they are one in the same. She describes how classes deliver a great mix of elements like historical & current wisdom or philosophy, questions & workshop activities, individual and group time as well as pre-class tasks & post-class reading references. 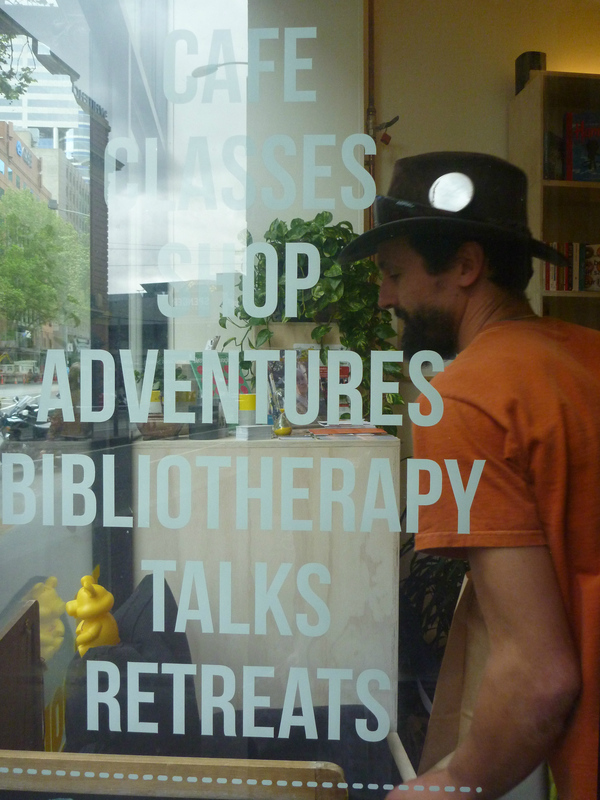 They also lash out a heavy dose of culture – think literature, film and art as a tool for examples, therapy and insight. I suspect it would be hard for someone to come away without something useful. Jess also says the classes have a kind of practical “immediacy” to them – and she should know. After enrolling in “realise your potential” (because that was the only class not sold out), she quit her job the following day! 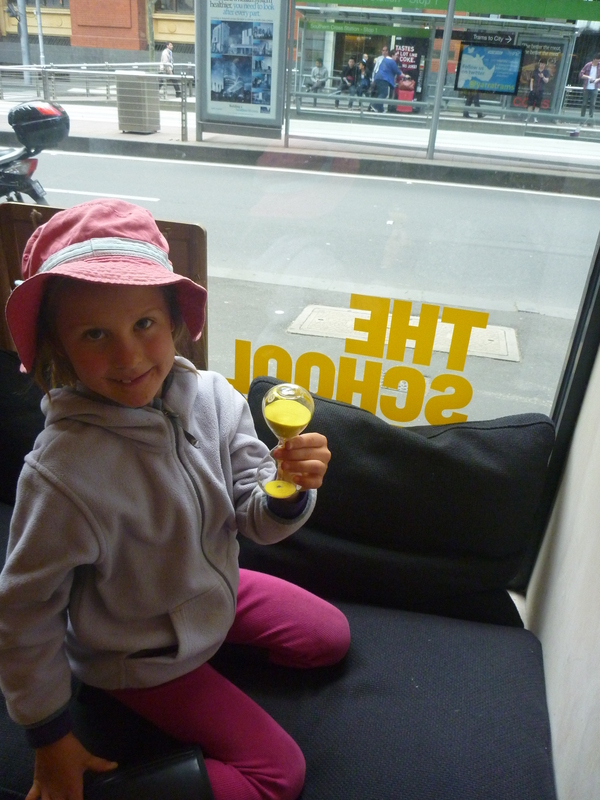 She also put her CV into TSOL and hey presto – that is how we came to find her there! Pretty good embodiment of what goes on there i’d say. I ask a last question – what is the most important job of TSOL? ‘developing emotional intelligence through the use of culture and community connection’ says Jess – if we can learn to find comfort in speaking and listening to strangers, perhaps it will help break down the barriers to open, richer relationships with those we love. We could even find others have similar situations, feelings or thoughts. We thank Jess for her generosity and stay to look around (and maybe we had drinks and cake too – not telling). So much goodness to be had – I only wish we could have taken a class while we were here. But as I said to Jess, Adelaide isn’t far away from Melbourne – we might just come on back one day! You can explore the website, classes and shop here or check out their new youtube channel here – I encourage you to have a look. May we find solice and solidarity in our shared stories. Ha ha – like my, like daughter.